On May 7, Park Ranger Katharine Womble found a stranded and unresponsive juvenile sea turtle on a beach near the Fort Fisher Recreation Area. After an initial assessment by the North Carolina Wildlife Resource Commission Sea Turtle Program Assistant, the animal was delivered to the North Carolina Aquarium for rehabilitation. Its condition upon arrival was so grave, it couldn’t be kept in water as it couldn’t lift its head; caregivers worried that it might drown. Aquarium staff decided to bring the animal to the Karen Beasley Sea Turtle Rescue and Rehabilitation Center in Surf City but discovered the facility was too jam-packed at the time to take even one more turtle. So…the aquarium staff and a veterinary team from North Carolina State University began administering treatments for dehydration, vitamin deficiencies and infection. As the turtle started to evidence improvement, the staff turned its attention to healing the animal’s shell that had been compromised by ulcers and erosion. After more than two months of continual care, veterinarians declared the 16 pound, 15 inch turtle healthy enough for release. The sea turtle was given the name “Womble” and was assisted in its return to the ocean on July 18 by staff members who cared for the animal. The aquarium’s Public Relations Coordinator, Robin Nalepa, said the facility has released other animals back into their natural habitats and such events are always a cause for great celebration. 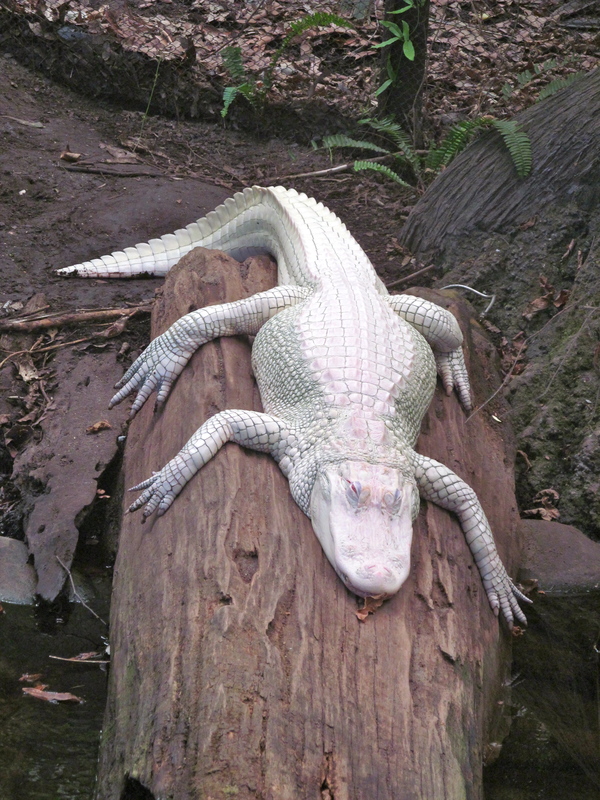 Luna is one of only 50 albino alligators known to exist in the world. Luna, whose name was chosen by staff after a naming contest that generated nearly 1,500 responses, came from a nest in Louisiana. From there, she was sent to the St. Augustine Alligator Farm in Florida. In February of 2009, she made the trip up to the North Carolina Aquarium. 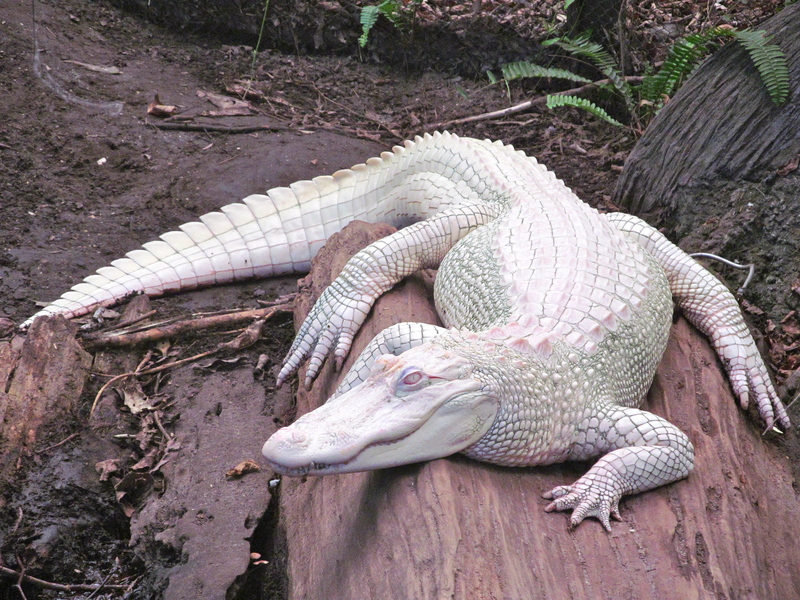 Next fall, Nalepa noted, the staff expect to move her from the enclosure she now occupies in the Cape Fear Conservatory to an exhibit with other of the facility’s American alligators. Her current home will be developed into a new exhibit featuring bald eagles. The North Carolina Aquarium at Fort Fisher in Kure Beach is one of three such facilities in the state (the others are at Roanoke Island and Pine Knoll Shores). 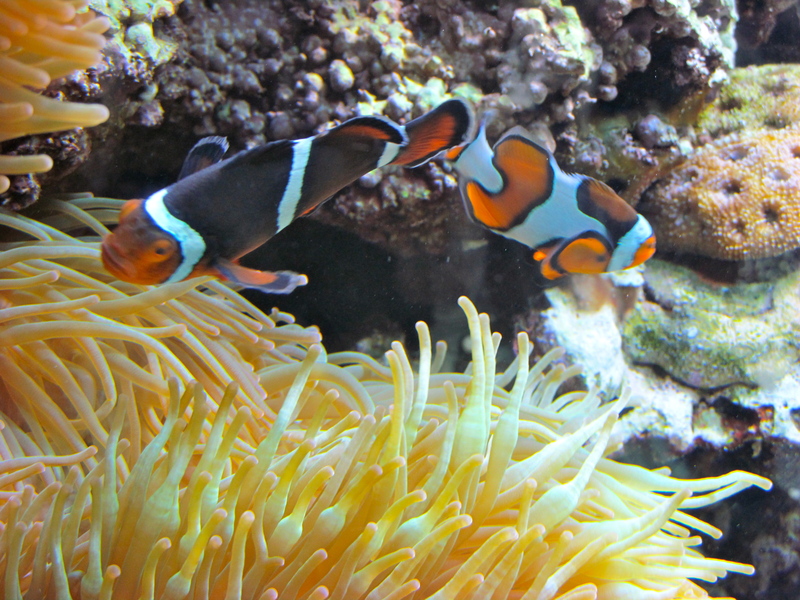 All were started in the 1980s as marine resource centers and all were renovated and reopened as aquariums in the 2000s. The Fort Fisher site is open from 9 a.m. to 5 p.m. seven days a week (save for some holidays). For more information, visit http://www.ncaquariums.com/fort-fisher. 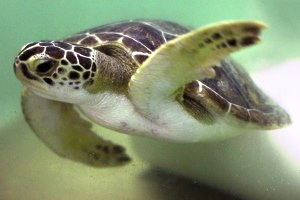 Image of the juvenile green sea turtle by the North Carolina Aquarium. All other photographs by Donna Hailson. The lionfish, native to the Indo-Pacific, is now a confirmed invader of the deep Atlantic. A diver entering the alligator tank; the denizens have been separated from her with a barrier. Adventure Reef: this play area was opened for use last summer.